Bundt Entertaining Cook book has More than 100 bundt recipes. 9 x 9 hard cover spiral-bound book offers unique entertaining ideas using recipes which have all been developed for our bundt pans. Recipes include desserts, entrees and much more! 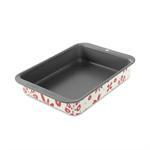 Nordicware English Shortbread Pan, American Made! 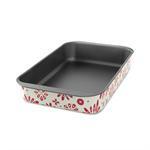 Nordicware's 9" x 13" square baking pan features the fun red and white folklore pattern. Great for brownies, cake, and more! American Made. 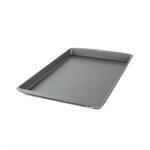 Our 9" x 9" cake pan is a perfect baking pan for brownies and bar cakes. Red and White Folklore pattern, made in the USA by Nordicware. 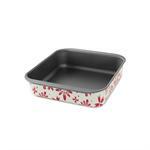 This 15" x 10" cookie sheet can also be used as a jelly roll or baking sheet. Cute folklore pattern. American Made by NordicWare. The compact size of this casserole pan makes it ideal for smaller casseroles, cobblers, and brownies. Festive red and white Folklore pattern. American Made by NordicWare. 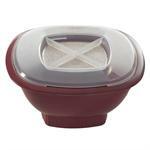 Nordicware's Microwave Popcorn Popper in Red is an quick and easy way to make popcorn with or without oil. BPA Free Plastic Popcorn Popper, made in the USA by Nordicware.